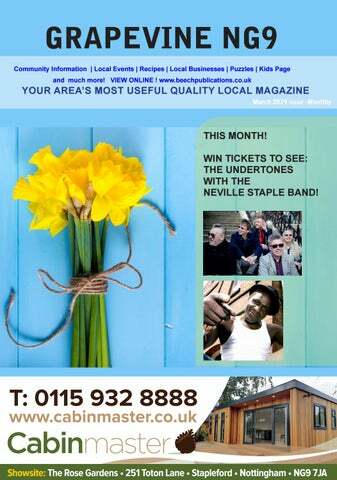 Our superb magazines contain relevant and current local information for the community. They are stylishly presented and over the last six years have proved to be hugely popular as they are generally kept by the reader until the next one arrives. Business Editorials – an excellent way to let the readers know more about you and your business! “Health & Beauty and Well Being” Pages – very popular! This month: FOR ALL ROCK FANS, a competition inside for two lucky readers to win tickets to see UFO in Birmingham. A delicious recipe from Fiona who owns Little Larder Catering. Plus new advertisers who have come on board with the Grapevine offering some great services. 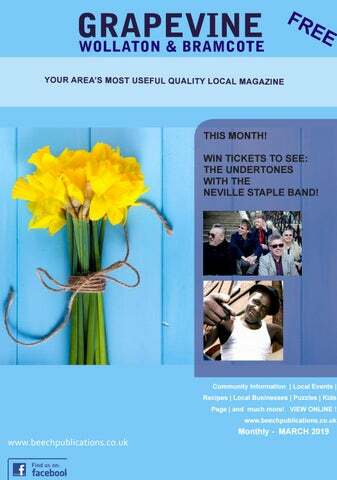 Two competitions inside for two lucky readers to win tickets. One entry is to see the talented Eddi Reader at Drill Hall in Lincoln, and the second one is to see Walter Trout playing at the Engine Shed in Lincoln! GOOD LUCK. This month, we have a lovely vegetarian recipe, (even if you’re not a vegetarian it really is a refreshing change to have something different on the table) hope you enjoy it. Hi everyone, This month we have a beef curry, slow cooker recipe for you (you can also cook this on the hob too) a great winter warmer for a cold evening. Plus another interesting read from Emma Snow who has just celebrated her 18th birthday. Hi everyone, This month Glorious Homes in Sandiacre are organising a one day paint course, for anyone wishing to learn how to re-vamp furniture or other items, look on page 23, a creative day out. Heritage weekend is in September, it’s a chance to visit places that is not normally open to the public and all entrance to these places are FREE, I can’t list every single event but visit the website, see pages 44,45,46, & 47.